“I used to think being a celebrity is unattainable (in my case) so I never really considered pursuing show business. I didn’t think I have what it takes to be one; good looks, charisma, talents etc. But I’m here… I’m coming… I am getting there,” Maine Mendoza recalled on her blog. A few months before she wrote this, the then-unknown Mendoza uploaded a Dubsmash video of her impersonating Kris Aquino, one of the most popular hosts and actresses in the country. Her impression was so on point that it came to no surprise that the video went viral and smashed records. In just 24 hours, it earned over one million views and was shared by thousands of people – ultimately cementing herself as the Dubsmash Queen of the Philippines. A million Facebook followers and a fanbase that is still growing at a near-exponential rate later, Maine Mendoza still has with her that infectious and cheerful air retained from the videos that made her an overnight sensation. However, she does not upload Dubsmash videos anymore, she now does her impersonation live on Eat Bulaga, the longest-running noontime variety show in the country, as Yaya Dub. The people behind the said variety show took no chances when they found out about her; they immediately capitalized on her growing popularity by inviting her to be part of the show – a stint Mendoza gladly accepted. Her inclusion on Eat Bulaga made waves across social media, which would eventually lead to a tidal of change in the entertainment beach. On July 16, while “Yaya Dub” was doing her impersonation live on TV, Alden, Mendoza’s not-so-secret celebrity crush was suddenly shown on the studio split screen. Caught off-guard, Mendoza was obviously tickled pink and could not concentrate because of Alden. However, both played along and “flirted” with each other live on TV – this marked the beginning of the first KalyeSerye or street series in the Philippines, starring the accidental love team turned phenomenon called AlDub (a portmanteau of the tandem’s character names). The new love team took the internet by storm and millions of netizens are still going gaga over it. As a result of its meteoric rise in popularity, the success of AlDub has become an important phenomenon to study. Eat Bulaga’s rival show, ABS-CBN’s It’s Showtime, used to be the “netizens’ favorite” noontime show – they always churn out hashtags, which usually reach the top of the trending list on Twitter. However, the tables quickly turned when the KalyeSerye was created – Eat Bulaga has now usurped It’s Showtime in terms of online popularity. 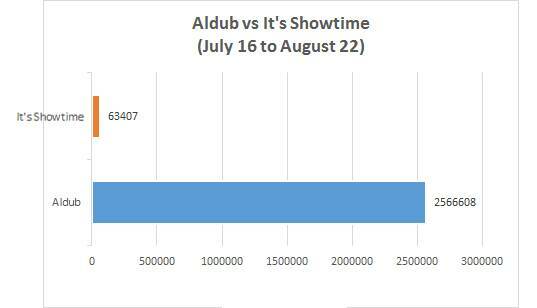 As shown above, the popularity of It’s Showtime on the Internet fizzled during the week the AlDub love team was born. Although it is hard to pin-point the one thing that made the AlDub a phenomenon, by reviewing the current television landscape in the Philippines and through social media analytics, TO THE NEW Digital has come up of a list that shows why Eat Bulaga is currently obliterating the competition. 1. Maine Mendoza already has an online fanbase before she joined Eat Bulaga. Unlike most newcomers in the entertainment industry, Mendoza already made a name with her Dubsmash videos. These viral videos served as her launch pad to the entertainment world. As a result, many of those who have seen them got curious about her role in the variety show. 2. In the Philippines, love teams have the most devoted online fans. The popularity of AlDub is seen as a threat by fanbases of other love teams, particularly the Jadines and the Kathniels. 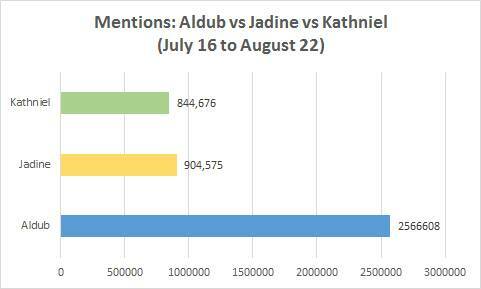 Prior to Aldub, these two fanbases had the most powerful online presence, and when the AlDub phenomenon has hit the scene and started eking out Kathniel and Jadine in terms of online buzz, the social media immediately became a battleground among these fanbases. 3. Eat Bulaga uploads the whole episode of the KalyeSerye on their Facebook page. Unlike ABS-CBN, GMA, the network where Eat Bulaga is airing, does not have its own video on demand and video streaming service like the iWantv. But as an answer to this, Eat Bulaga uploads their KalyeSerye segment hours after it was aired on TV to make it more accessible to the public. 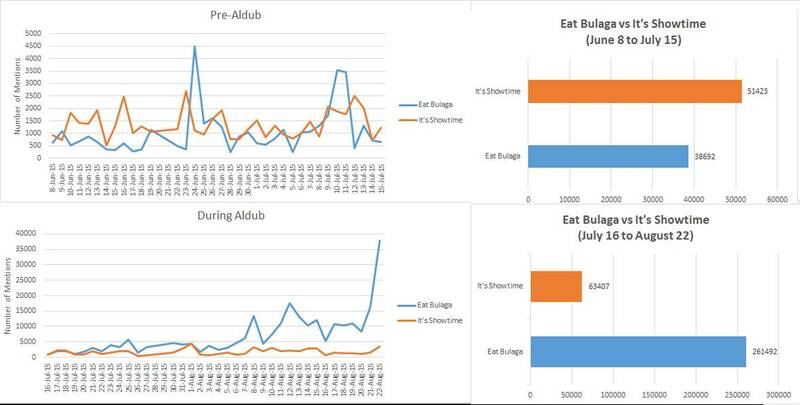 This tactic proved to be effective: All of the uploaded KalyeSerye episodes have racked up at least one million views; the official Facebook page of Eat Bulaga continues to rapidly increase in terms of reach, page likes, and engagement. 4. Eat Bulaga succeeded in attracting the social media and digital-savvy Millennials while, at the same time, retaining their regular audiences. The media landscape continues to change at a fast pace and it is evident that “traditional or old media,” which includes the Television, is waning in popularity because of the unstoppable rise of “new media.” This might seem to be a huge problem for decades-long TV shows, but Eat Bulaga has managed to stand at the cusp of a huge digital revolution and succeed in finding an equilibrium between old and new media, as shown in the TV ratings. There are no ironclad rules in creating a hit TV show by any means, but in its 36 years of airing, Eat Bulaga continues to respond and adapt through changes, break the rules, and see the magic in the banal – making it an unbeatable institution in noon-time TV watching. How digital media made International Yoga Day a global phenomenon?